Where do I use my Denby voucher code? The specialist's team at Denby pride themselves on the outstanding craftsmanship of their pottery which they have been creating in England for over 200 years. The immensely strong Derbyshire clay used in each and every product is sourced from just behind their factory - the same way it was centuries ago. Using their traditional skills, the specialists turn it by hand into stunning stoneware which you can buy online. 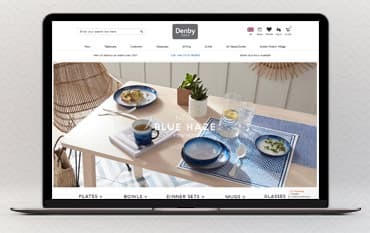 Shopping online means you can also make great savings when using one of our Denby Voucher Codes which guarantees you great discounts online when shopping for your favourite household essentials. Artists in Derbyshire became pioneers in pottery when they used their techniques to turn clay into household products which is now classified as the famous Dency collection which we know and love today. Now, boasting over 5000 glazes and an increasing selection of distinctive colours, shapes and patterns, all hand finished ensuring no piece is the same. Everything created is only passed through 25 hands and handed the Denby seal of approval so you can guarantee everything is unique and unlikely to be found elsewhere. Denby continues to craft timeless collections of pottery as well as seek out current trends to create modern adaptations. Shop online and see what Denby can offer you and your home today for less when using NetVoucherCodes. Each and everything in the Denby Tableware collection is beautiful and built to be a lasting piece of furniture for your home. Uncover styles to suit every taste and enjoy both classic and contemporary products to match your home decor. Denby knows exactly what modern dining looks like which is why they create ideally sized bowls, generous places, impressive entertainment platters, serving bowls, nibbles bowls and so much more. Creating beautiful designs is at the core of everything Denby does and you can guarantee they are built to last a lifetime. Offering beautiful form without the formality, shop the Denby tableware collection and be pleasantly surprised by the extensive collection which also includes cutlery, drinkware and even table linens. Shop the selection today and don’t hesitate to add one of our money-saving Voucher Codes onto your order to enjoy the best value online. Whether you’re lunching with family, dining with friends or hosting a party, a stylish dinner table is bound to impress, whatever the occasion. The Denby Glassware collection has been designed to complement your tableware as it includes coordinating colours and compatible shapes so you don’t have to worry about the miss-matching. Uncover the stunning selection of Glassware available at Denby including Wine Glasses, Champagne Flutes, Crystal Glassware and the premium Monsoon Collection. Ensure your table makes a statement all year round with Denby Glassware. For over 200 years Denby has been providing quality kitchen and dining room pottery along with a superb selection of serve-ware and utensils. Boasting a stunning an array of statement pieces and stylish essentials, uncover a beautiful collection of glassware, pots and pans, tableware, bakeware, utensils and much more. If you consider yourself houseproud, Denby is the place to search if you’re looking for something cut above. Using a Denby Voucher Code could help you save money off your next purchase meaning you can shop quality, hard wearing and functional household essentials for less!